This Whirlpool Fridge-Freezer's innovative Supreme NoFrost design offers unprecedented food preservation technology and features, providing the ideal frost-free climate for your food. The unique 6TH SENSE Fresh Control technology dynamically adjusts the humidity levels and temperature inside your freezer, to ensure long-lasting freshness (up to 4 times longer). The Fast Freeze function sets the freezer temperature to 10 degrees colder than the lowest setting, to freeze food quickly and retain its nutritional values. The integrated water dispenser in your fridge uses state-of-the-art filtration and anti-bacterial systems, to provide you with fresh, clear and clean drinking water, always. Neatly and safely store glass bottles with the dedicated Bottle Rack. This Whirlpool Refrigerator provides a second crisper drawer, so you'll never run out of space for your fruit and vegetables. This Whirlpool Fridge Freezer features a fan that provides a smooth and even flow of air in your appliance's cavity, for enhanced ventilation. The Temperature and door alarms are a great idea.I like that it has an antibacterial filter which preserves my food for longer. The child lock on the water dispenser is a much needed feature. I love the water dispenser. I also really like the party mode function as it alerts you when your bottle of wine has been chilling in the freezer for half an hour. The alarm to let you know that you have left the door open is also really handy. 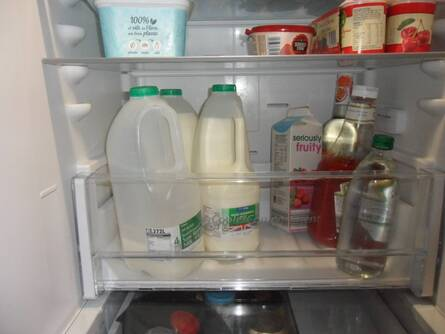 I love it all but was disappointed that i could not fit a 4 pint of milk in the door with two shelves in. This was easily sorted by taking the top shelf out. How many thermostat does this fridge freezer has? It has one thermostat which you'll find on the front of the fridge door just above the water dispenser. I do I set up my shelves to have the most space?? Please help me someone!!!!!! I took the wine rack out to give me extra shelf space and used the large draw under the shelves to stand my bottles in. Hope this was helpful. The Whirlpool BSNF 8451 OX AQUA Fridge Freezer in Optic Inox has supreme no frost technology offering the no.1 in fresh and frozen food preservation. 6th Sense fresh control technology creates the ideal conditions to keep your fresh fruit and vegetables fresh for up to 4 times longer, meaning less trips to the supermarket and less food thrown away. Supreme no frost technology means that there is no frost in your fridge or freezer. 6th Sense freeze control technology preserves your frozen food for longer. On those summer days where you need ice quickly, our quick ice function can product 2 trays of ice in just 30 minutes. For the perfect fit into a 60cm width space, this fridge-freezer's doors are thin so they can be opened fully against the wall, allowing you total access to drawers and shelves. The Whirlpool BSNF 8451 OX AQUA Fridge Freezer combines contemporary design with functionality and makes the perfect appliance for any household.